Enjoy a True Clarity of Connection with your Horse - TODAY! Ride in a Clinic - Immerse into FEEL! Private Coaching - Call for Extra Help at a Clinic or for Karen to Come to your Barn. The Feel of Release: ENJOY! Pressure and Release, or Just Release? 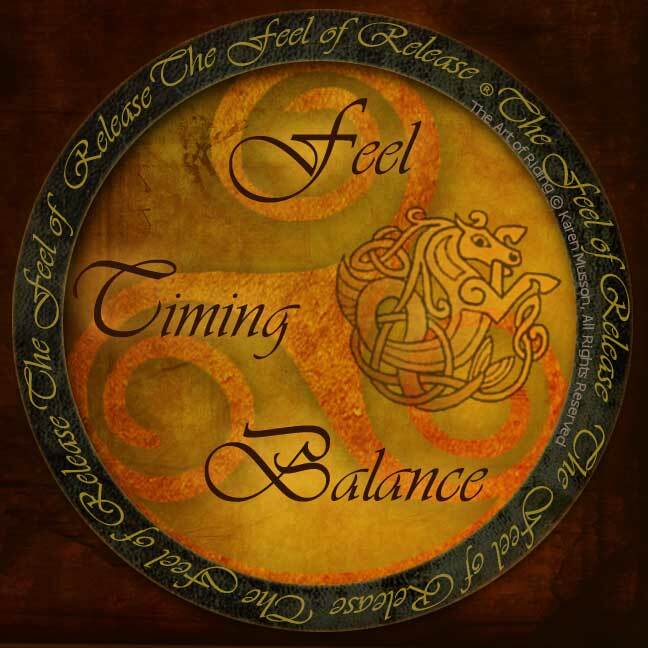 How I Came to "Feel and Release"
What is "The Feel of Release"? Why "The Art of Riding" ? What is The Feel of Release? Why "The Art of Riding"? "It feels like a fight at the start of the ride"
"You allowed the horse to get self release. Not good if you want to control the horse"
"You need to be a better leader for your horse"
"I see an 'opening' as anything that allows us to help guide, however briefly, an individual in the direction we ultimately would like to go. An 'opening' can be, and often is, a very subtle form of communication between horse and rider that can easily slip past us if we're not paying attention. 'Openings' can and do work both ways. [...] It amazes me just how small an 'opening' can actually be, whether working with horses or with people, and how easy it can be to create an 'opening' when one is needed." "I truly believe developing the ability to see and use 'openings' effectively is only one piece of what one might refer to as the 'harmony in horsemanship' puzzle. When this idea of understanding 'openings' is brought together with the understanding of two other simlar ideas - making a connection with another indvidual, and the role distance plays in overall communication - I believe it is then that harmony in horsemanship becomes a much less daunting concept for us." "Bill knew about a place I did not know existed, or could exist, between a horse and a human being [...] Bill included each one of my horses in that information exchange. Over the course of many months,... he took each one by its lead rope and, later, by the bridle reins. Using what he called his 'better feel', Bill showed me and each of them exactly what he meant by what he did [...] It was not long after I made the switch from force when needed (often) to always customizing the feel I offered to a horse, that two tough horses I had misunderstood for years developed into my most reliable mounts." "The Real Masters Understood Feel [...] For example, De Kerbrech, (French officer in the cavalry of Napoleon III) really understood horses. He had it fixed up so the horse could succeed. [...] The first time I read Beudant's book was in the 1950s. The way he explained things, there was no doubt in my mind about what a person needed to do to get these little things working for them and their horse." "You must in all Airs follow the strength, spirit, and disposition of the horse, and do nothing against nature; for art is but to set nature in order, and nothing else." "A confrontational approach ‘Astonishes the Weak Horse […] makes a Furious horse Madd; makes a Resty Horse more Resty […] and Displeases all sorts of Horses’. The alternative however is not ‘to Sit Weak […] but to Sit Easie’, in the understanding that ‘The Horse must know you are his Master’"
The Art of Riding ©2007-2019 Karen Musson, All rights reserved. Site layout, page design including color combinations, The Art of Riding, TheArtOfRiding, The Feel of Release, The Spirit of Feel and Hector's Hill Farm are marks of Karen Musson.